Being overweight increases the risk of developing the most common type of US esophageal cancer, while drinking alcohol increases the risk of the second major type of this cancer, finds a new systematic review of the global research. The report released today by AICR and the World Cancer Research Fund International (WCRF) reaffirms and strengthens the findings of a previous AICR/WCRF report. In the US, AICR estimates that one in three (33 percent) of esophageal cancer cases could be prevented if people did not drink alcohol and were a healthy weight. That’s approximately 5,600 esophageal cancer cases every year. Alice Bender, MS, RDN, Head of Nutrition Programs at AICR, said: "These findings add to the evidence that lifestyle plays a powerful role in cancer risk. Obesity is now linked to eleven types of cancer and alcohol links to six. We want individuals to know you can take important lifestyle steps to reduce risk for many kinds of cancer." Diet, Nutrition, Physical Activity and Esophageal Cancer found there is strong evidence that being overweight or obese increases the risk of esophageal adenocarcinoma, one of the two main types of this cancer. The report shows a 48 percent increased risk of esophageal adenocarcinoma for every 5 unit increase in Body Mass Index. Previous AICR research has found that – in addition to esophageal adenocarcinoma – excess body fat increases risk for advanced prostate cancer, ovarian cancer, post–menopausal breast cancer, colorectal cancer, liver cancer, endometrial cancer, kidney cancer, stomach cardia cancer and pancreatic cancer. Adenocarcinomas generally develop in the lower esophagus, starting from cells that make fluid. Approximately six of every ten US esophageal cancer cases (62 percent) are adenocarcinomas. The report also found strong evidence that consuming alcohol increases the risk of esophageal squamous cell carcinoma – 25 percent increased risk per 10 grams of alcohol per day. This is equivalent to about a glass of beer or wine. The report collated and reviewed the 46 scientific studies available on esophageal cancer, diet, physical activity and weight in the first such review since 2007. 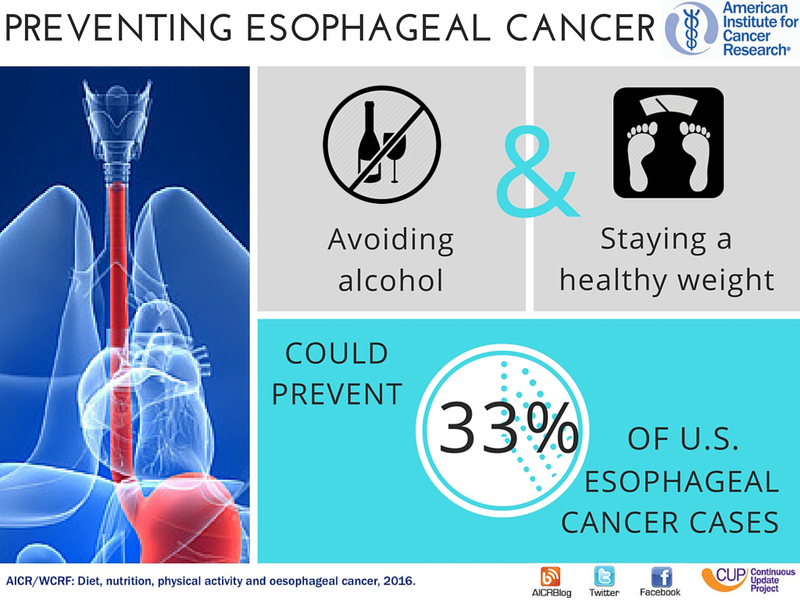 The research covered 15 million adults of whom 31,000 were diagnosed with esophageal cancer. 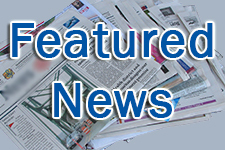 Sources: WCRF/AICR Continuous Update Project. Diet, Nutrition, Physical Activity and Esophageal Cancer, 2016. Esophageal data by types from SEER Cancer Statistics Review 1975-2013, National Cancer Institute.